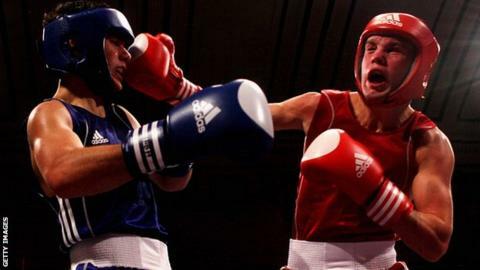 Former Great Britain amateur star Iain Weaver says he is set to be granted a licence by the Boxing Union of Ireland after being refused one in Britain. Weaver, from Ferndown in Dorset, had his licence application turned down by the British Boxing Board of Control on the advice of a medical panel. The 23-year-old has a cyst on his brain, but has been cleared to box by two independent specialists. "It's good, I'm happy that I can still keep fighting," he told BBC Sport. "Iain is a cracking fighter that belongs in the pro game. He is a really talented young guy and a real tough nut. "His style is much more suited to the professional scene and, a bit like me, he loves a tear up. "I'm looking forward to watching him develop and like the rest of the boys in the stable, I'll be there to help him out along the way." Weaver, who will fight at super-featherweight, is signed to promoters Matchroom Sport, but despite turning professional in July, he has yet to make his debut after a routine medical revealed the cyst. Two independent neurosurgeons have since said they are happy for him to fight, which led to him contemplating legal action against the board and having to pursue a licence abroad. "We (also) sent the scan to the professor (Jack Phillips) in Ireland and he said I was fine to box," said Weaver, who won a featherweight silver medal at the 2010 European Championships in Moscow. "He didn't see any danger at all so they've accepted me and I can have an Irish licence, but I'm confused as to why three neurosurgeons can pass me, but the British Boxing Board cannot." The board's general secretary Robert Smith said the issue would be discussed again at a meeting on 13 February and their decision would not be influenced by Weaver being granted an Irish licence. "Iain Weaver will not be granted a licence until we feel he is fit to fight," Smith added. Weaver still hopes the board will change their mind but is contemplating a move to Ireland if things do not go in his favour. "I couldn't just train and live in England and then go and fight over there. I may have to vacate over there until I can sort a licence over here in England," he said. "I could fight abroad in America and Spain and do the same thing. I really want my licence to be granted in England, so I can fight for British titles. Hopefully now that other boards are saying I am safe to fight, they (BBBofC) might do the same."